Thu., Aug. 23, 2018, 5 a.m.
Pedaling hard, Jake McGrew fought to keep up his RPMs. McGrew did. Five of his teammates crowded behind him in the testing room on the Washington State/Eastern Washington campus near downtown. He passed 80 RPMs. They cheered. McGrew was done. He removed the oxygen mask from his face, something a bit more complex than anything to keep smoke out of your lungs. “Water, water, water,” Chiefs teammate Eli Zummack said as he retrieved a bottle. Like Jaret Anderson-Dolan who finished just before him, it would be a few minutes before McGrew could catch his breath and speak. “Feel all right?” Duncan asked. 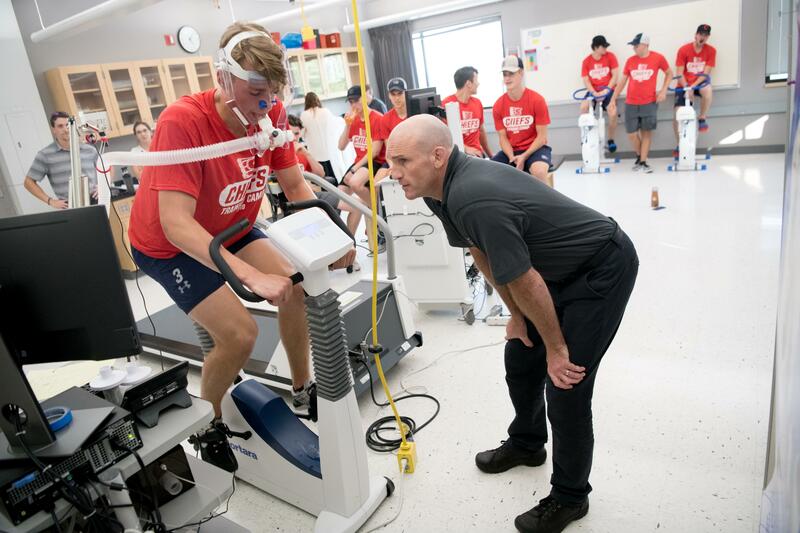 Tuesday marked one of the first official events of the 2018-19 Spokane Chiefs hockey preseason: physical fitness, a mouthguard fitting and VO2 Max testing. This workout was the latter, and the results – a number that measures, essentially, exercise intensity – are a source of individual pride and accountability, as well as team data, for the 22 returning players from last season’s squad. On Wednesday, about 40 new players, including draft picks and a few other invitees, arrived wearing mismatched gear and aiming to make the squad. They’ll go through only the first half of the testing, which is the more standard run of height and weight, stability jumps, bench press, squats and curls. But for now, this was a reunion of sorts for a group that reached the Western Hockey League playoffs last year under now second-year coach Dan Lambert. Lambert said he likes the information the VO2 Max test in particular gives him and the training staff. The higher the number, the more efficiently the player is using oxygen. Duncan pushes them in intervals of 30 seconds, getting them to maximum exertion. Duncan, the chair of the Nutrition and Exercise Physiology program at WSU, calibrated this particular test to mimic that given to players at the NHL combine. He has given the test to many athletes across various sports. Players want to do well because, in some sense, it’s a way to measure how much work they put in during the offseason. They huddled around a list of numbers from last year – which admittedly was a slightly different test, and wasn’t a fair comparison – and were eager to see whether they had done better this year. For Anderson-Dolan, the application of the data is clear on the ice. “If you get caught out in a shift, it definitely shows if you’ll be able to keep going,” he said. They’ll be out on the ice starting Thursday , at the first of three days of scrimmages. The 60 or so players at camp will be split into three teams of 20. By Monday, only about 30 will be around as they head into the next week of camp. Some of this data collection will endure. During practices, players wear heart monitors, which is becoming common practice in the WHL, trainer Joe Hurley said. He likes to know how hard players are pushing in practice and Hurley can then see the fatigue practice can create. Hurley retold a conversation he had with Ty Smith last year, when he told the defenseman that he had gone particularly hard in consecutive practices. Sure enough, Smith told him he was feeling it the next morning. From then on, Hurley said, Smith was happy to have that information. Tuesday, before being fitted with the elephant-like mask, Smith asked Duncan a series of questions aimed at understanding the test and maximizing his number. Published: Aug. 23, 2018, 5 a.m.